The royal couple has a packed schedule. 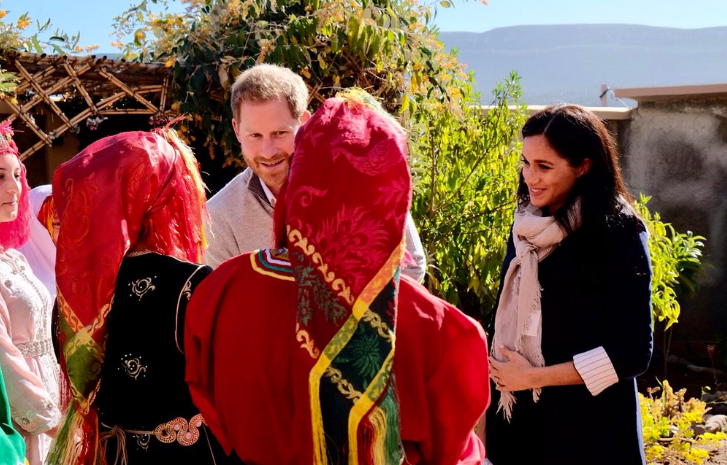 Rabat – Prince Harry and his wife Duchess Meghan Markle arrived in Asni today, a small town in the High Atlas mountains 50 kilometers south of Marrakech. Upon their arrival, the group of girls from the village greeted the Duke and Duchess as they were carrying UK and Moroccan flags. The girls also sang songs in Amazigh to express their happiness over the visit of royal couple. Videos posted on the Twitter page of the UK embassy in Morocco show the royal couple chatting with the girls from the region. The Duke is wearing a grey sweater and black classy pants, with brown shoes, while the Duchess is wearing a blue coat with a black paint paints and simple flats. 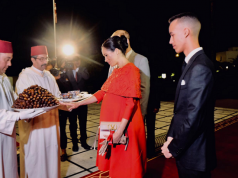 The day will be eventful for the royal couple as both of them, packed with several activities that reflect Moroccan culture. 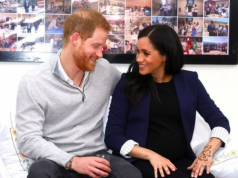 The pregnant duchess will be offered a henna ceremony as her right hand will be adorned with Moroccan henna tattoo, which is part of the Moroccan culture. The ceremony will take place at the Moroccan NGO Education For All boarding houses, where they will meet teachers. The NGO aims to educate and provide girls with the necessary aid to encourage them to finish their education. The NGO provide the girls with the opportunity to have access to secondary educations. During their visit in the boarding houses, the Duke and Duchess spoke with girls studying for exams. 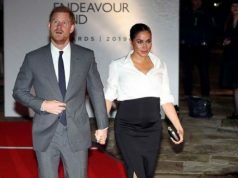 On Sunday evening, Prince Harry and Meghan will head back to Rabat for an official reception at the residence of the British ambassador. 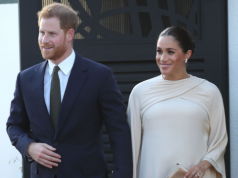 On Monday, the royal couple will also visit the Moroccan Royal Federation of Equestrian Sports in Rabat, the Villa des Ambassadors restaurant for a cooking class on traditional Moroccan cuisine, and the Andalusian Gardens in Rabat.